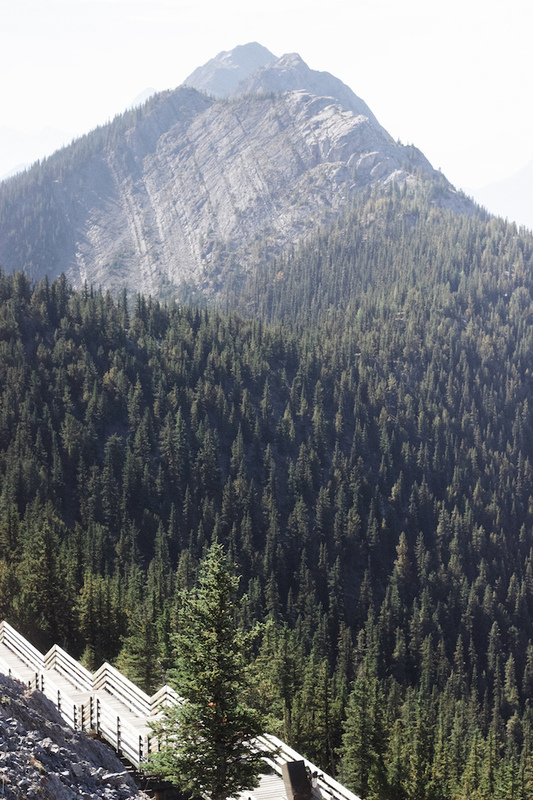 We stayed at the Falcon Crest Lodge in Canmore, a quieter town just 20 minutes outside of downtown Banff. For cheaper accommodations, look here. Our first day started with a 4 AM wake up call to head to Moraine Lake. I promise I'm not crazy - the parking lots here are completely full by sunrise. 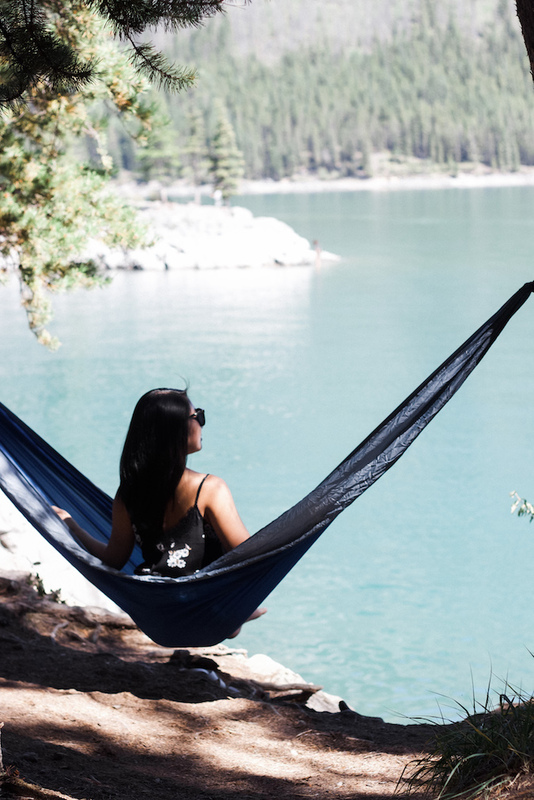 Get an early start to enjoy the scenery with some peace and quiet! 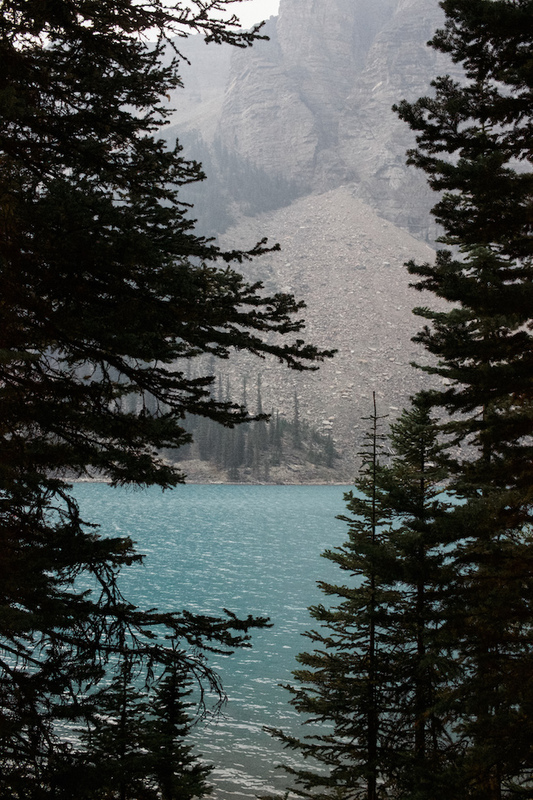 This morning was a smoky one for Moraine Lake, but nonetheless stunning. We spent the early morning strolling along the shoreline and soaking in our first sight of these amazing lakes. I recommend climbing the rock pile for overhead views as well. 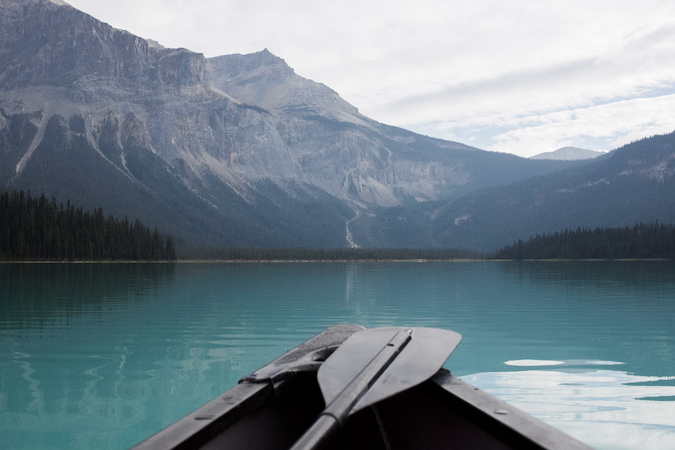 Canoeing on Moraine is about $90 CAD, and while I'm sure the experience is worthwhile, I'll be sharing a better deal later in this post. 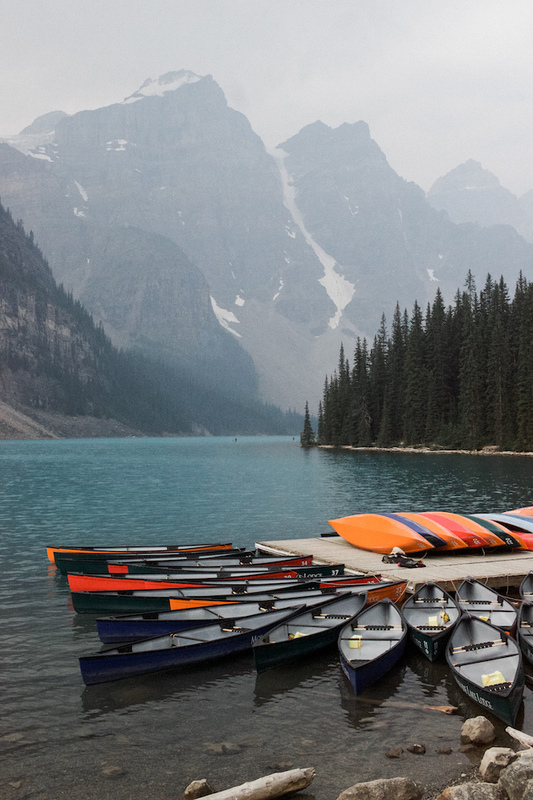 Just a 15 minute drive from Moraine Lake is Lake Louise, arguably the most famous site in Banff. For that reason you will likely see more tourists here than anywhere else. 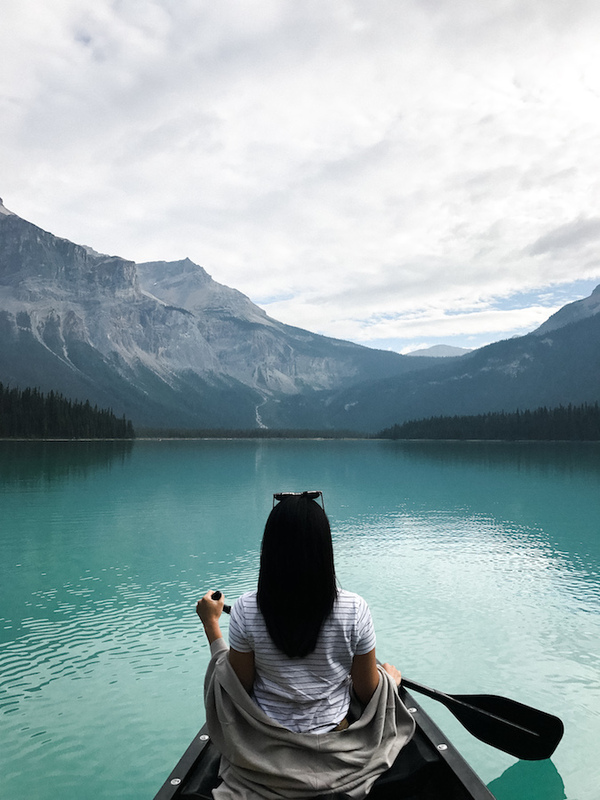 Many reviews claim that Lake Louise is overrated because of tourist congestion, but if you focus on the lake itself you'll understand why it is so widely visited. I'm not sure how a place with such sheer beauty can be labeled as overrated. 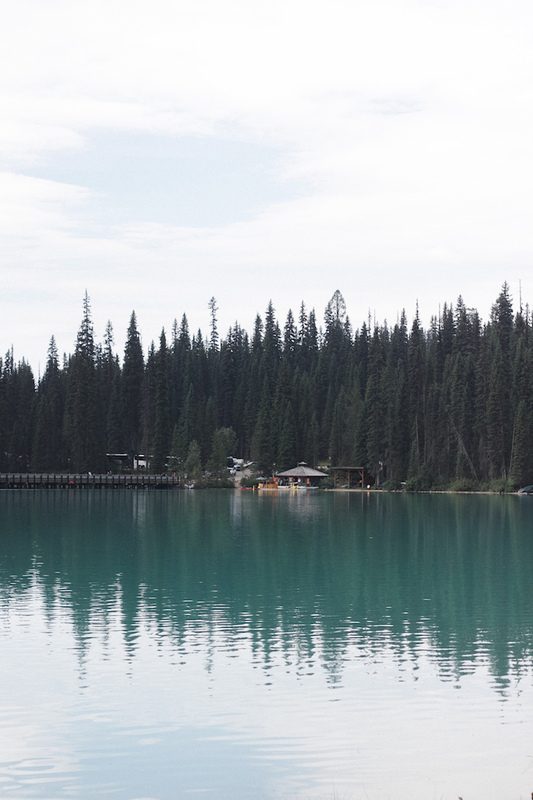 Nearby the lake is the tiny village of Lake Louise where we grabbed quick sandwiches at Trailhead Café. This might be obvious, but I don't recommend dwelling on your culinary experience in Banff. Save that for the cities. We spent most of our midday meals at small cafés to optimize our time. 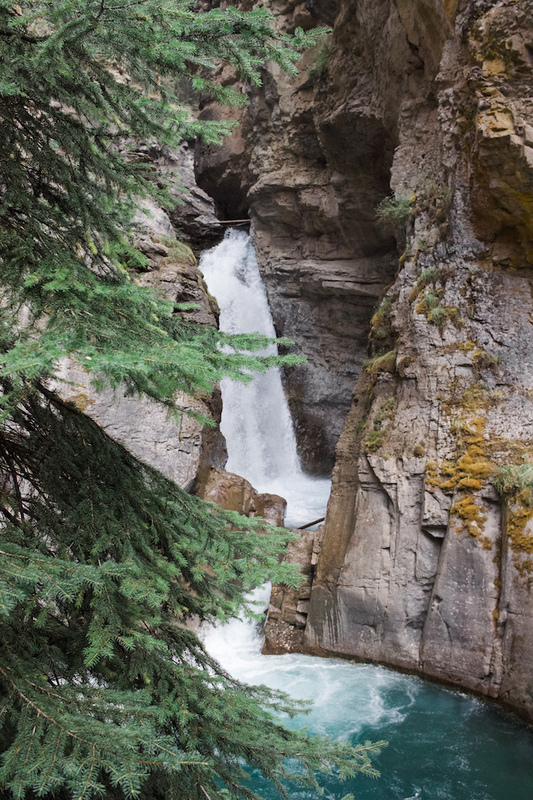 After a morning by the lakes we headed out for our first hike at Johnston Canyon. This is a relatively moderate hike with a mix of natural and constructed paths, and of course, amazing scenery. The initial trail to the lower falls is any easy half-mile that winds between canyons and concludes at a lovely waterfall view. You're able to wait in line to stand behind the waterfall, but there is a hidden alternative if you stay patient and continue towards the upper falls. 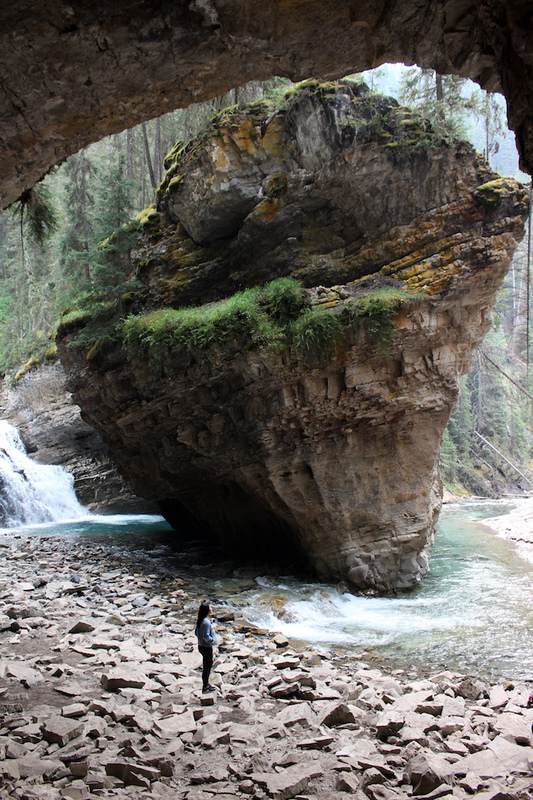 The secret to truly experiencing Johnston Canyon is finding the off-trail cave that opens to the incredible view below. I promise, it's real. The steep trail to this cave is located a little more than midway between the lower and upper falls. Look to your right along the path and you'll see an opening leading down - chances are you'll see a few other hikers heading down as well. Here you can also stand behind the small waterfall without the line. We spent so much time in this cave that we didn't even bother seeing the upper falls. This detour was truly the highlight of the hike. For an early dinner we drove to The Maple Leaf Grill & Lounge in downtown Banff and dined over a slightly over-priced but delicious meal. 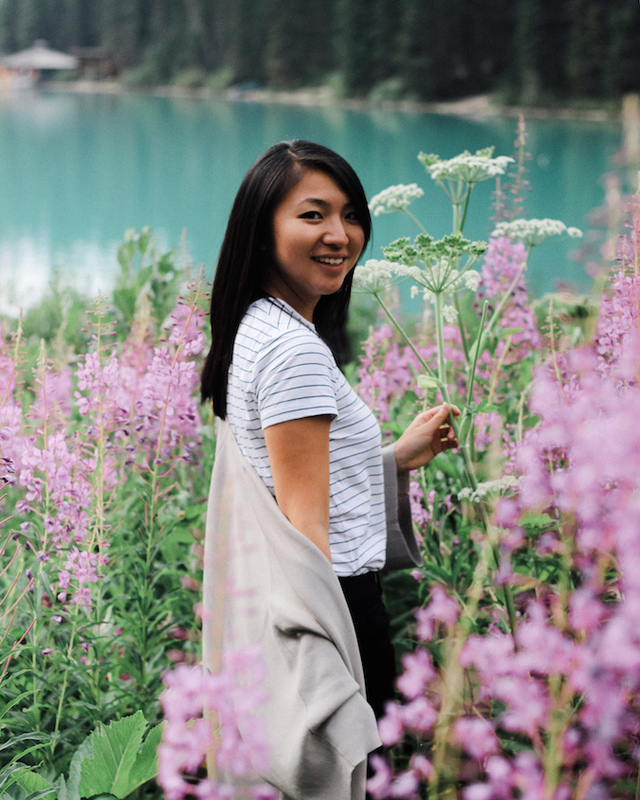 I don't usually spend time shopping while traveling, but downtown Banff is worth the visit just to stroll the quaint streets that lie between the mountains. The scenery from downtown is unlike what you'll see from any other town or city. Another day, another early start. 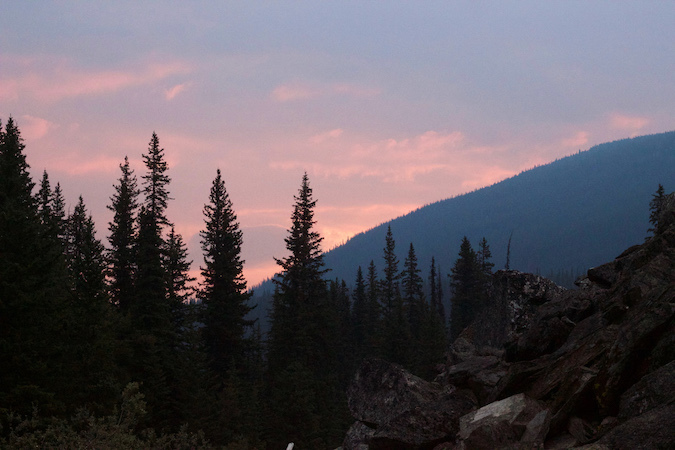 We left Canmore around 6:30 AM to drive 1.5 hours into British Columbia's Yoho National Park. 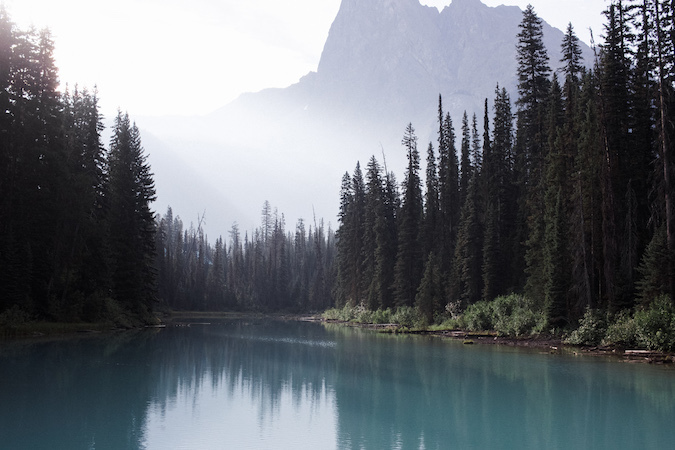 Here we found a much quieter escape and my favorite lake of the trip, Emerald Lake. As I mentioned earlier, if you make the drive here you'll be rewarded with a cheaper and in my opinion, more beautiful option for canoeing. 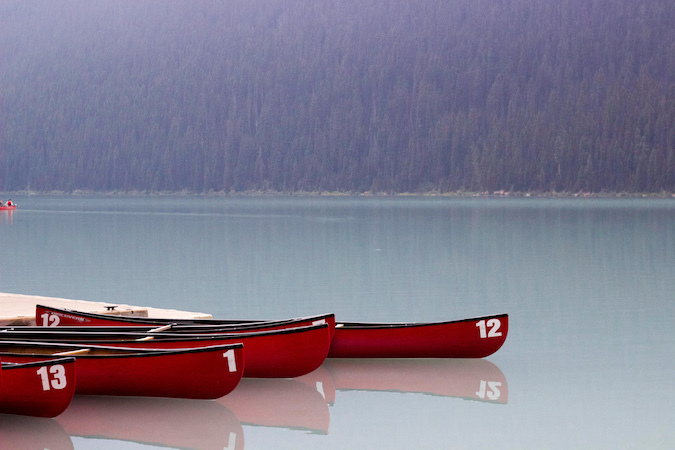 Rentals from Emerald Lake Lodge are about $60 CAD for a three-person canoe. 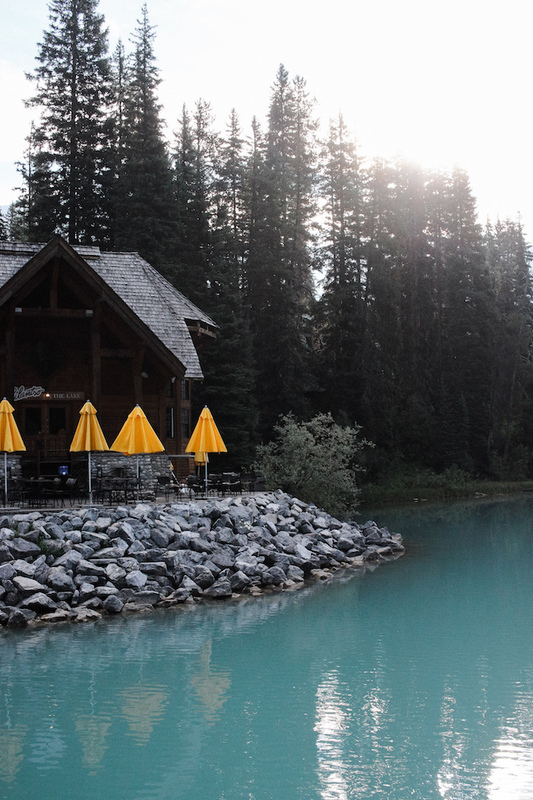 Although Emerald Lake is much quieter than the others, arrive early to secure an immediate rental. I'm typically more of a kayaking person, but any opportunity to be on a lake this magical is worthwhile. 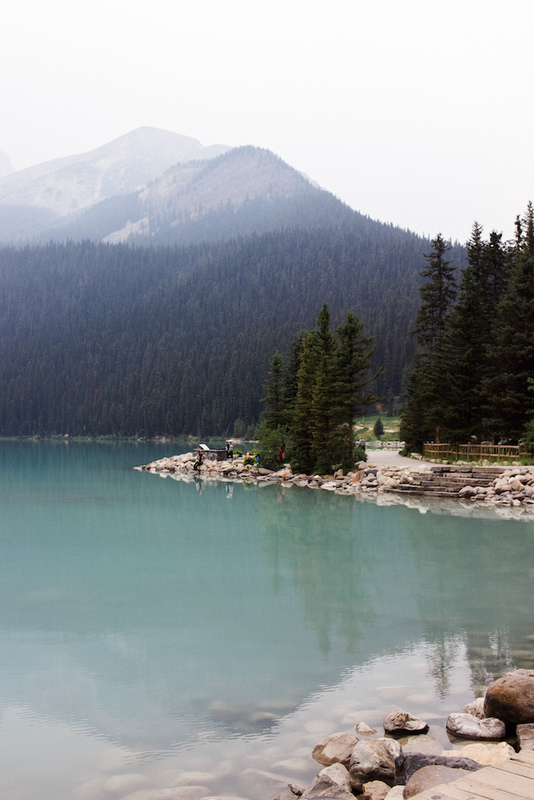 The water is truly a shimmering turquoise that sits against a backdrop of sweeping mountains. The entire experience is unlike any other. After returning our canoe we strolled along the shoreline trail, where purple wildflowers add some bright color to the path. Naturally we had to stop for a photoshoot. At this time we also caught a glimpse of the eclipse despite having very low visibility in Canada. It was a special moment to say the least. 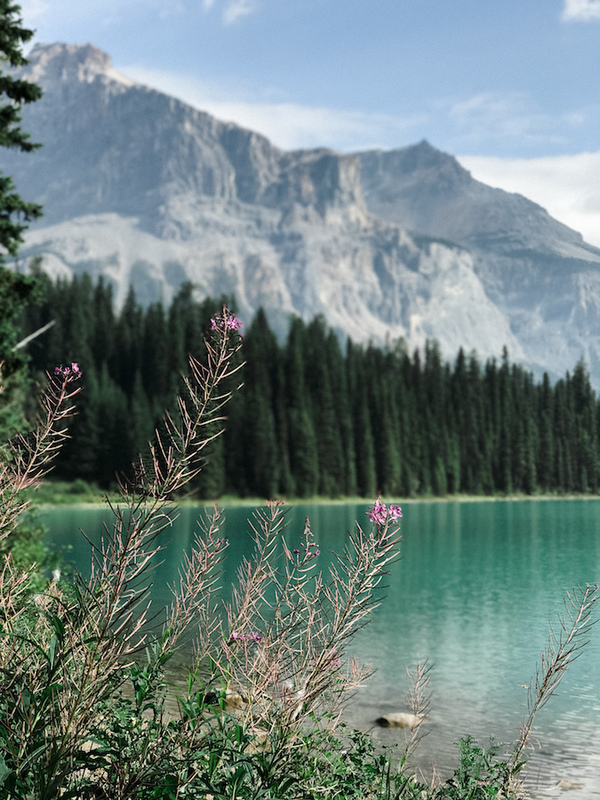 Just five minutes outside of Emerald Lake is the tiny town of Field - blink, and you'll miss it. The town has a population of just 170 people, but for such a small area it has some great food options. 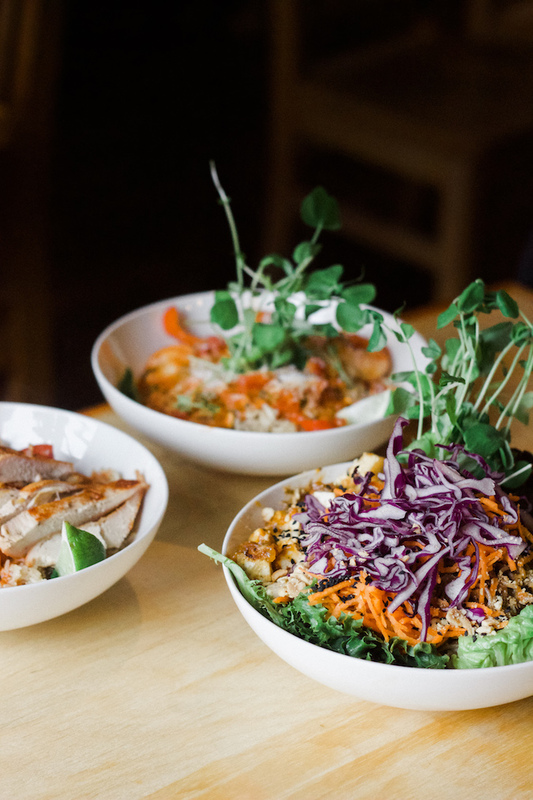 We stopped at The Siding Café for the healthy bowls below. Surprisingly this was one of my favorite meals of the trip. 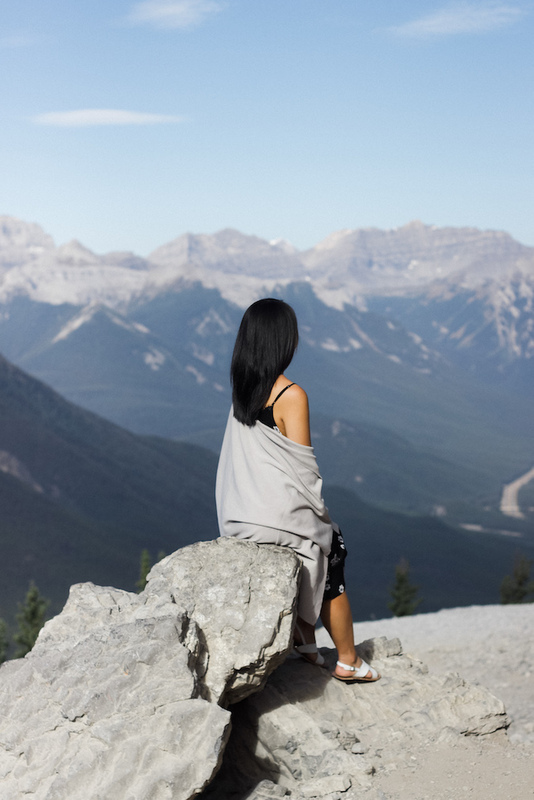 For the afternoon we returned to Lake Louise to take on the short but steep Fairview Lookout Hike. 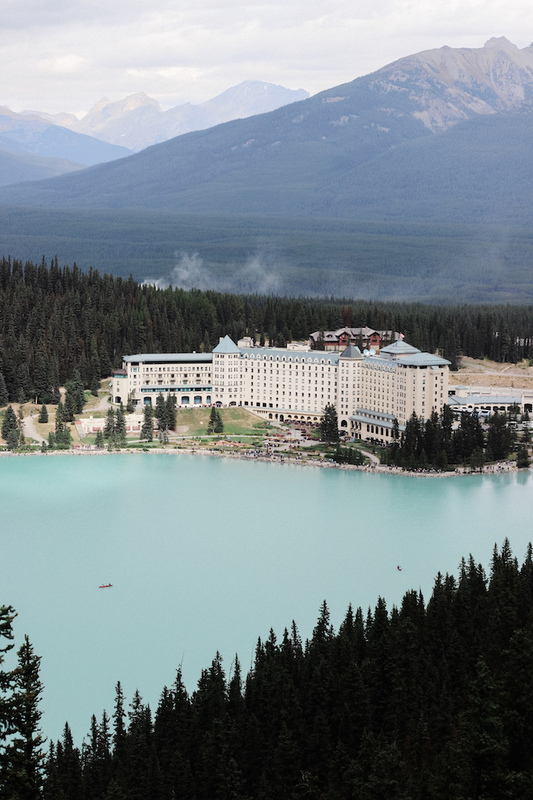 In just twenty minutes you reach a small lookout with a stunning overhead view of the lake and adjacent Fairmont hotel. It is a low commitment hike with high reward. We concluded our day by venturing around Canmore, a lesser explored area compared to neighboring Banff. 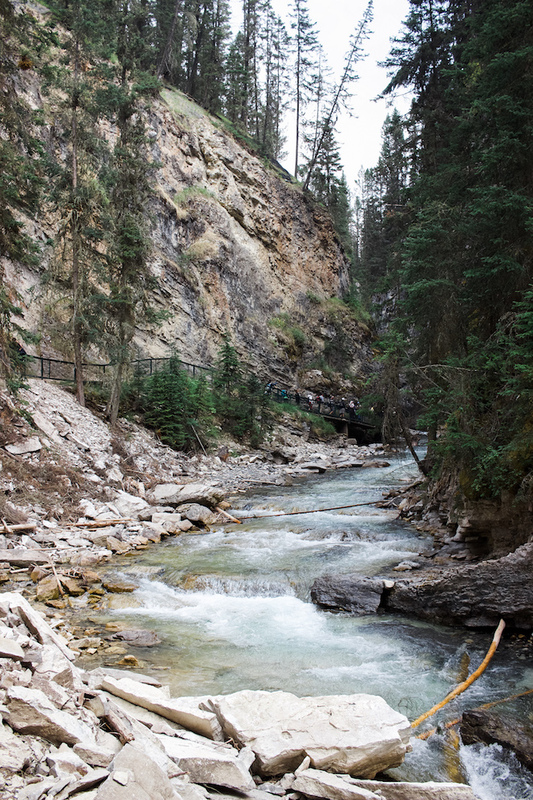 If you have time to make the drive, the roads to Grassi Lakes are extremely rocky but well worth the experience. 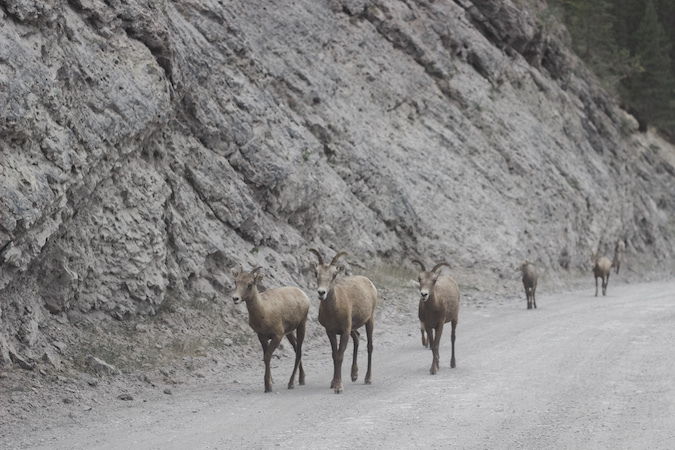 You will likely run into wild goats on the way up, which easily became one of my favorite parts of the trip. 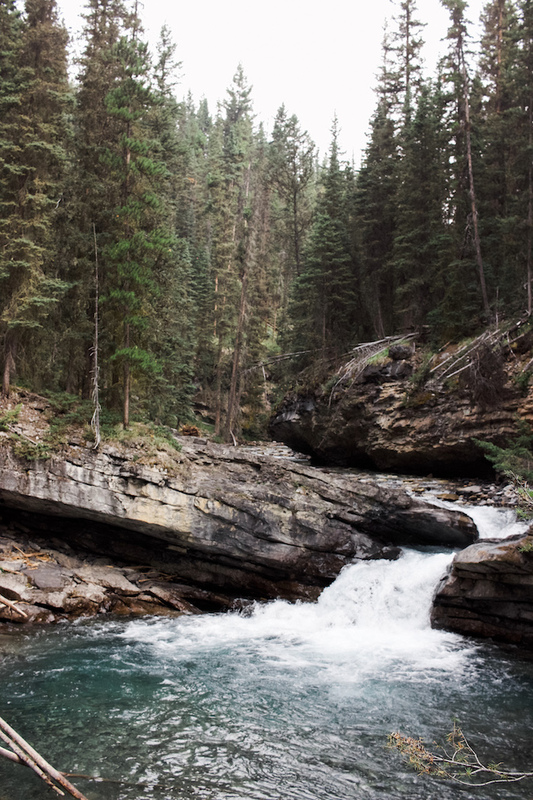 After about twenty minutes of a rough drive you'll reach Spray Lakes, a hidden gem that is not widely visited. The most unique part of this area is its mixture of rock and clay along the shore that crumbles at your feet when wet. It was the most unrefined area we visited, which made it all the more beautiful. If you find yourself dining in Canmore I highly recommend Tapas Restaurant. I always love a good tapas meal and was pleasantly surprised by the quality of food here. Finish off your meal with dessert nearby at Old School Bus Ice Cream. It is exactly how it sounds - an old school bus repurposed into an adorable ice cream shack. 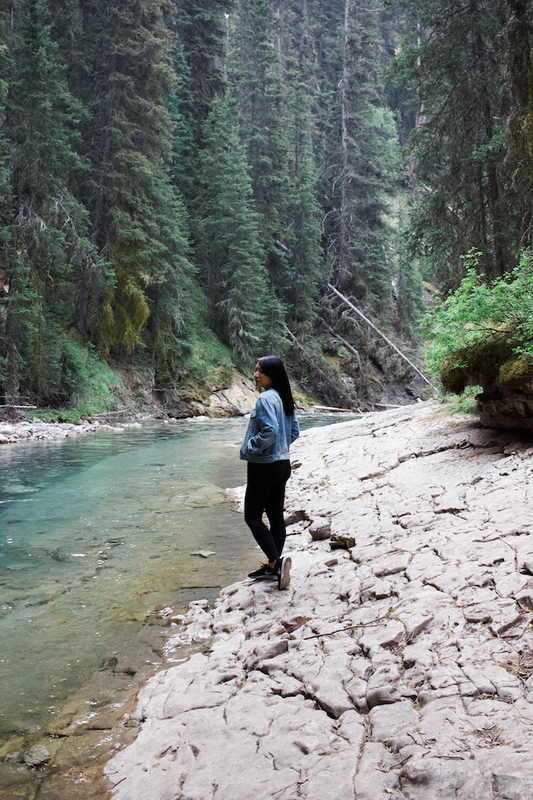 Our final day in Banff was a quick one, but we made the most of our time before flying out. 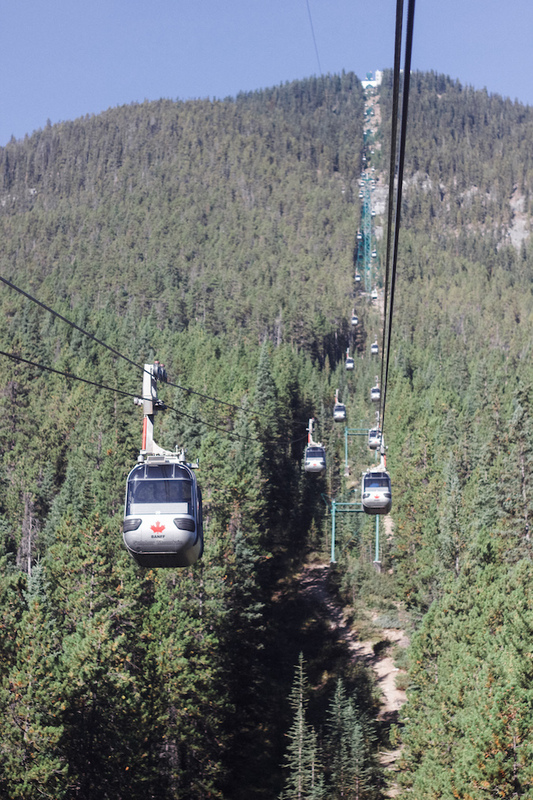 As a break from hiking we took the Banff Gondola to the top of Sulphur Mountain, where constructed paths lead you around the summit for mountain-range views. If you have time to spare, there are also hiking trails leading to the summit. Either way, it is a gorgeous visit. 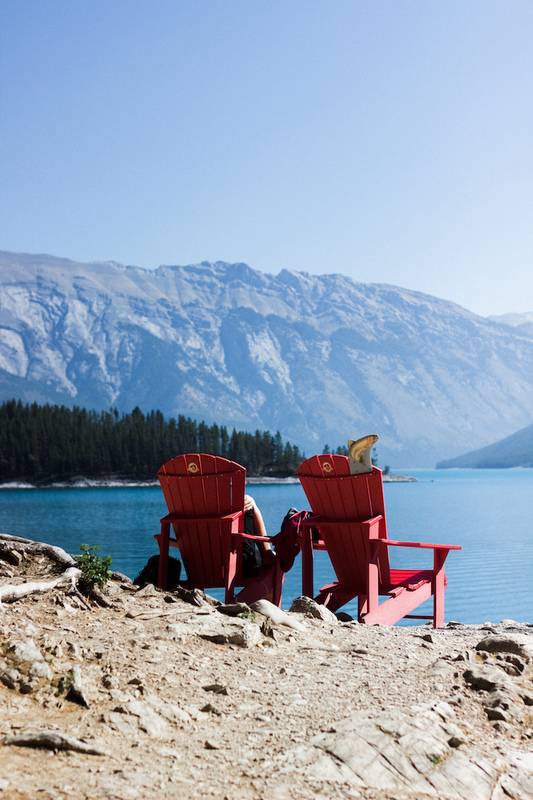 We had intended to make a quick stop at Lake Minnewanka before our downtown lunch but ultimately cancelled the reservation to picnic in the area instead. I'm pretty confident that was the right decision - just look at those views. I'm not sure I could ever get tired of these shimmering lakes. Needless to say, this was my favorite trip of the year so far. There is something humbling about experiencing nature at its finest. 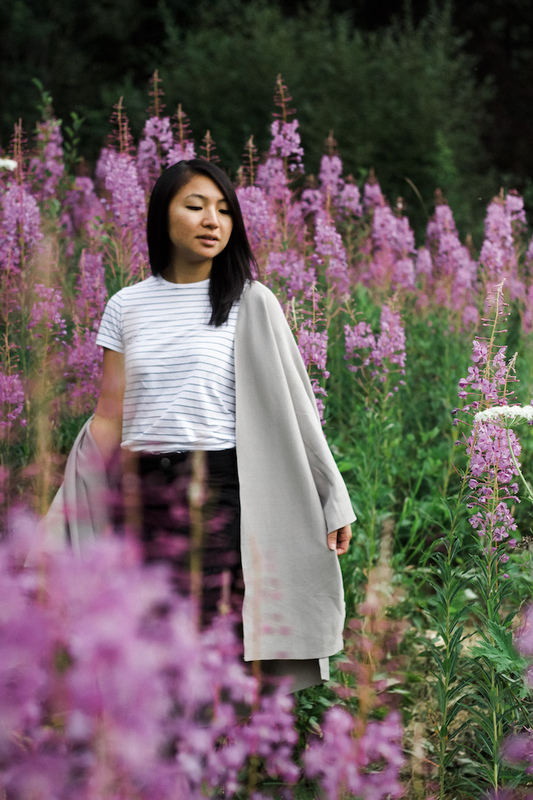 It has a a way of putting your personal life into perspective and sparking an appreciation for the planet we live on. If this place is not already on your list, I suggest adding it now. I don't think it will be long before I go back myself. I can completely understand why it's been your favorite trip so far! It looks absolutely stunning. So peaceful and magestic. These photos are absolutely amazing! 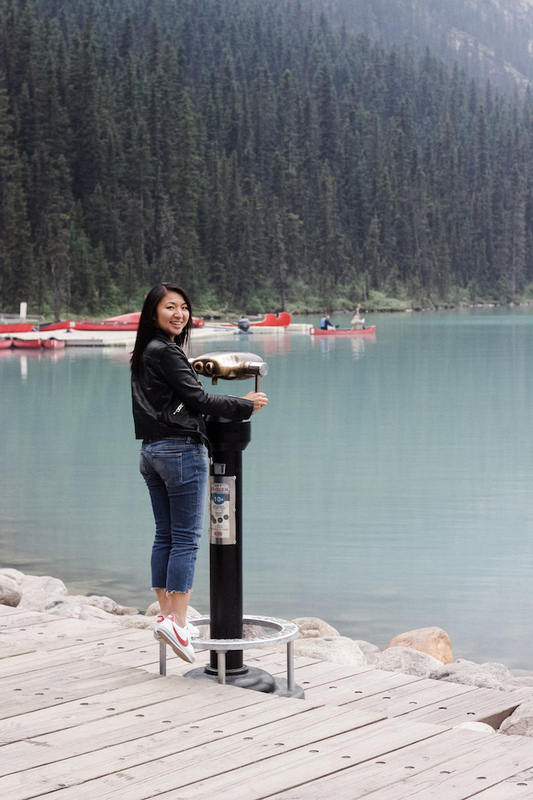 Banff and Lake Louise are some of my favorite places to visit! Wow these photos are amazing, what a beautiful place Christina. That hotel looks like Grand Budapest! drum chandelier, it's so nice. Ok this was a totally MAGICAL experience. I can see why it took you long to express it in words. Just beautiful! Wow!!! This kind of beauty must be seen in person. 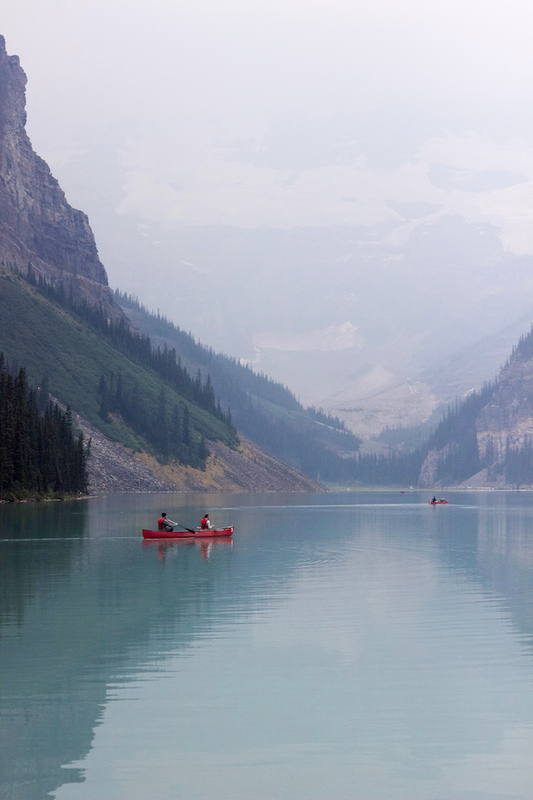 I would love to go canoeing one of these days! Wow theses photos are incredible ! I wish to visit this amazing place one day ! How serene are these pictures! Trust you had a great time. Wow, just wow! These photos are incredibly beautiful!! I need to visit this place! Spending time in nature is so lovely! It's nice to see a detailed post of this amazing destination. We're supposed to go here later this month but opt for Niagara instead. Looking at these photos made me think we should visit this but I have smaller kids including a toddler and I'm thankful to you being honest about rocky paths and waking up early which is not possible with my family situation right now. Maybe, we'll be saving this destination when the kids are older. For the meantime, I enjoy looking at your photos. Did you go with a tour guide or in a group tour? Wow! 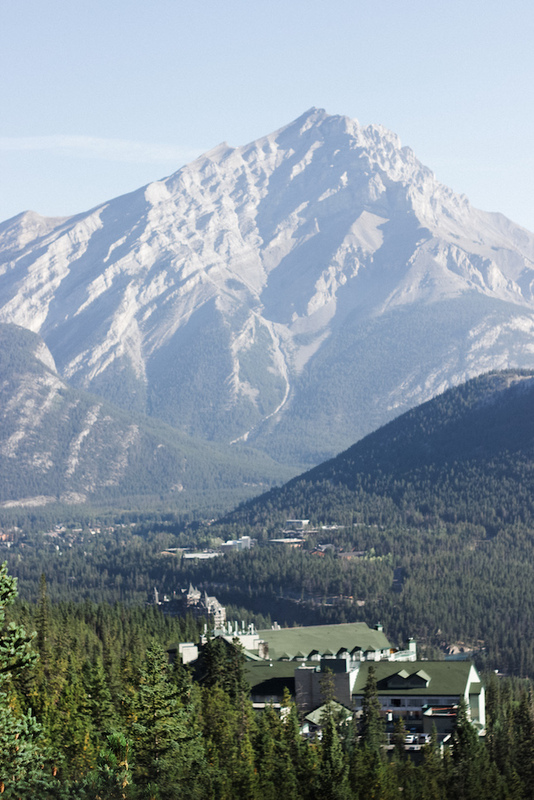 Banff is jaw-droppingly beautiful!! This place is really high on my bucket list.